These compositions are contemplative by nature, with a simplicity that is intended to support the texts. They are influenced by folk, celtic and early music. The songs included on the CD Take Wing in Song include texts from the Indian mystical poet Rabindranath Tagore, Hilde Domin, Hannah Senesh, Theodore Roethke, Mary Austin, and the Psalms. Other songs are soon to be recorded. Originally, all of these songs were sung with voice and guitar or a capella with one to three voices. In playing and performing them over the last few years, different arrangements have grown and developed. These have included vocal ensemble, cello, piano, accordion, viola da gamba, saxophone, flute, and percussion. Working with these wonderful musicians has been and continues to be a big part of the joy in this journey! As a child of two wonderful musicians (and grandchild of another), I had the privilege of growing up surrounded by music. I grew up playing violin and later flute, ending up with a passion for the guitar. 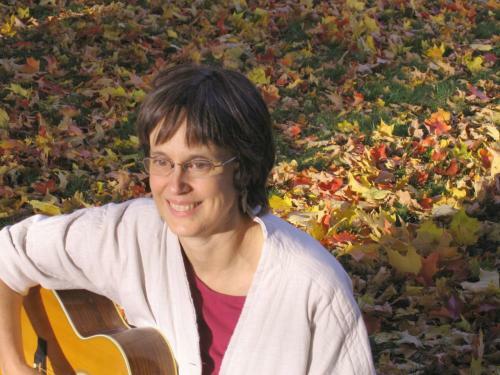 In my thirties, I began writing songs accompanied by guitar, solo or with two to three part harmony, and arranging Celtic, Israeli, and traditional American songs. I’ve been finding beautiful texts and writing songs ever since. In 1998 I moved to Europe for a year and stayed for ten, raising a family with my husband and working. While I was there, I put together an ensemble to perform these songs with a reader, a saxophone/flutist, a viola da gamba player, and a modern dancer with whom I worked collaboratively on choreography. We had the opportunity to perform in some very beautiful, old, resonant churches in Europe (imagine saxophone in such venues!). In 2007, we moved back to the states, to Rhode Island. Shortly thereafter, I recorded Take Wing in Song with musicians from New England and lots of support from family and friends! Along with the joys and challenges of work and family life, I’m continuing to write music and am in the process of setting up a small recording studio in our home.